Most of you know that Simon & Schuster has released a “Young Readers’ Edition” of my 1999 novel Pay It Forward. It’s been edited down to a solid G rating (by yours truly) and is suitable for kids as young as eight. Of course, now the challenge is to get these books into the classroom. That would be easier if schools had lots of money for books. They don’t. Teachers are all too often buying books for their classrooms with their own money. And they don’t exactly have money coming out of their ears. So a few weeks ago, the Pay It Forward Foundation and I launched a project. I donated $1,000 to the Foundation for the purchase of paperback copies of the Young Readers’ Edition. Simon & Schuster was kind enough to offer us a special discount, so we were able to get 325 books to give away. Thing is, half of them are gone already. And I haven’t even announced that the program exists. These were just teachers who had already contacted us in hopes of getting help acquiring some. The Foundation board (of which I am a part) was kind enough to vote to match my donation with Foundation funds. So another 325 books are now on order. If you’re a teacher, you can learn how to apply for them HERE. And if you know a teacher, you can pass this info on. But here’s where we need your help. If you simply pass along the info that free books are available, they will be gone in a matter of days. If they even last that long. Then the program will be over. Here’s how you can keep it growing strong: You can pass along this blog post to everyone you know. With enough donations to this fund, we can keep this program going almost indefinitely. They don’t have to be big donations. Even $5 and $10 donations will go a long way if we can just get enough of them. And here’s how we get enough of them: You know how the concept of Pay It Forward works, right? It uses exponential math to plant roots. It starts with one, like this post. Then it goes to three, then nine. Then 27. Then 81. Then 243. Then 729. Then 2,187. The bigger it gets, the bigger it gets. What if you shared this appeal for donations with three people and asked them each to share it with three more? It could be in thousands of hands in no time. Books would flow into middle schools. Kids would be inspired to try kindness. The world would change. Maybe not entirely, but enough to make this worth doing. So, please. Spread the word that there are books to give away. But please also spread the word that we need help to keep the supply strong. You can help change the world. Information on how to donate to the Pay It Forward Foundation can be found HERE. And please note that your donation is for the Young Reader Book Program. After not doing much in the way of interviews for a while (actually writing books is key, I've found) I accepted two full-length interviews on Blog Talk Radio in the same month. Some of you saw the links on social networks, but if you missed them, they are now archived. The first is with my very old friend Barbara Hodges for her program No Limits. It's a bit geared toward writers, but also casual and fairly personal. You can hear it at THIS LINK. The second is with my Facebook friend Dean Buchanan for his program A Kind Voice, and is geared toward those interested in Pay It Forward. But it is also personal, and good for those who might want to learn more about me. And it's at THIS LINK. More news as it becomes available. And there's lots of exciting stuff coming up, so please stay tuned! Cover Reveal for Pay It Forward: Young Readers Edition! I ask you... how cool is this? This is the new cover for the young readers' edition of Pay It Forward that Simon & Schuster and I are working on right now. It's suitable for kids as young as eight. It's scheduled for August of '14. And it's available for preorder right now. If you are a Pay It Forward fan, please spread the word. Tell teachers, tell parents, tell kids. Finally, it's coming, a version of Pay It Forward that can be read by kids younger than Trevor. I'm looking forward to it, and I welcome your comments! It's close to time, but I'd like to encourage all of you who are interested in Pay It Forward to watch NBC Nightly News tonight. They're going to be doing a story on Pay It Forward/Good Samaritans/Random Acts of Kindness. And they sent a film crew all the way down from San Francisco so the producer could interview me in my home. I have no idea how long I'll be onscreen, and how much will end up on the cutting room floor. But you might want to tune in, or set it to record. And I'm sure by about tomorrow it will be accessible on their website, iTunes, etc. So I will update this blog post very soon with a link to the story, for anyone who missed it. Fingers crossed for how it turns out. But all publicity for Pay It Forward is good publicity, right? Oh. A "P.S. ": In honor of my (possibly brief) appearance on NBC Nightly News, and any new readers it might bring, we've chosen my novel When You Were Older to feature at only 99 cents, right through the Thanksgiving weekend. But if you're one of my existing readers, you deserve a deal, too. The 99 cent Kindle ebook is available HERE. Happy reading! Here it is. Short but sweet. For those who have been following me for years because you are Pay It Forward fans, I think you're going to like this news a lot. Most of you know that the book Pay It Forward was written for adults. It never occurred to me that anyone younger than an adult would read it, despite the fact that the major character of Trevor is only twelve when the books begins. Then the American Library Association chose the book for its Best Books for Young Adults list. I was quite surprised. The Young Adult classification is 12-18. So technically the American Library Association recommended it for kids as young as 12. I was never comfortable doing so. I'm sure it's fine compared to...you know, say, prime time TV. But there was no denying that there's a good bit of adult material in the book. As a result, when it's used in schools, which I'm pleased to say it often is, it's only in high schools. I suspect very few teachers are handing it to kids much younger than 14. Now for the big, happy news. Simon & Schuster has agreed to release a new edition of the book for Middle Grade readers, 8-12. It's not going to talk down to them. It's not going to be a different story. It's going to be the Pay It Forward book it's always been, but with a new rating. G.
I'm going to be doing the initial edit of the material, and then of course it will go through the editorial process at the publishing house. But I've had a good first conversation with my new editor, and we are very much on the same page in terms of what needs to be edited out, what needs to be maintained. Think in terms of Summer of 2014, though of course I'll keep you updated with news. Remember you always hear it here first! The rise of Audible.com has made a lot of my older audio editions available again. In fact, Simon & Schuster even re-released the unabridged audio of Pay It Forward. I only just recently found out how many of my titles really are available, so I'm passing the info along for any of my readers who enjoy Audible audiobooks. Click any of the images below to go to its Audible.com or Audible.co.uk page. On Tuesday, November 6th, Charley Johnson and I joined Lisa Cypers Kamen for a one-hour segment on Harvesting Happiness Talk Radio. For those of you who don't know Charley, he is president of the Pay It Forward Foundation and the inventor of the Pay It Forward bracelet. He also drives the movement through his website PIFExperience.org. Now our segment is available as a podcast. You can find it on the Toginet Radio list of recent podcasts under Tuesday November 6th, or on iTunes. Or...here's a direct link to download the show. Check out the new online blog and zine for Gifts That Give. You might see some author you know there. I'll be a regular contributor to the blog, sharing small bits of inspiration. 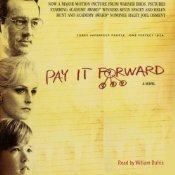 If you follow this link to my first post, you'll learn (if you don't know already) the story of how I was inspired to write the novel Pay It Forward, on which the movie was based. And if you choose to use the Gifts That Give website, you can choose the Pay It Forward Foundation to receive your 20% contribution! Here again is the link to their InspireMe U blog, and my first post, Kindness is Contagious. But check back, because there will be many more of my stories to come. Yesterday my dog Ella brought the roof down in that way she does when the UPS person is up on the porch. Only...I hadn't ordered anything. I brought the unexpected box inside and found 8 copies of a brand new edition of Pay It Forward in Simplified Chinese. Now, I agree that this news, all on its own, does not a Pay It Forward resurgence make. But it comes on the heels of a letter I received from Simon & Schuster about three months back, telling me they had just sold translation rights to a Hungarian publisher. The novel Pay It Forward is more than 12 years old. Just the fact that it's still in print is a publishing miracle. The new trade paperback edition put out by S&S in 2010 shows they understand the book is not going away anytime soon. In 2000 and 2001 the book was in print in about 30 different countries. But then, of course, it went out of print in those countries. This is normal in my business. Now it's coming back into print outside the US. This is not normal in my business, to put it in as understated a way as possible. My fourth reader slideshow is done, and this time it's all Pay it Forward, all the time. Many thanks to those who sent in photos of themselves with the book. If you watch this slideshow and think it looks like fun to be part of it, I'll probably do another at some point. So do feel free to send a photo of you, even at this late date. Two incredible bloggers (and by that I mean they have great blogs and are great people, both), Adam of Roof Beam Reader and Lauren of Shooting Stars Mag, are holding a giveaway and a blog hop for bloggers. According to the announcements on Adam's and Lauren's blog, these events are inspired by, and intended to celebrate the work of...me. I may have mentioned it briefly on this blog before, but my next reader slideshow is all Pay It Forward. It's a way of showing the world the faces behind the (growing by leaps and bounds!) Pay It Forward Movement. This year is looking to be a "tipping point" for Pay It Forward, so the time to do this is now. The Movement is about people, so let's get a look at them. See how varied and wonderful they really are. Here is the link to watch the TEDx event LIVE that I will be speaking at tomorrow, Saturday, January 7th. The event starts around 10:15am PST/1:15pm EST! Me, Vance (my mother, who kept the PIFF going for years nearly single-handedly) and Charley Yesterday in Buellton, CA (which is approximately halfway between Los Angeles and the little town of Cambria, where I live) I met up with Charley Johnson in person. I've worked with Charley for years, but I live in Cambria and he lives in Salt Lake City. So it's been email, phone, Skype...everything but sitting down and having an in-person conversation. Over 40 years ago, a public high school teacher named Lenny Horowitz changed my life completely by helping me believe I could write. And, since it was a change that was slow to grow fruit, I was never able to tell him. He was diagnosed with Hodgkin’s disease the following year, and died shortly after I left Buffalo.